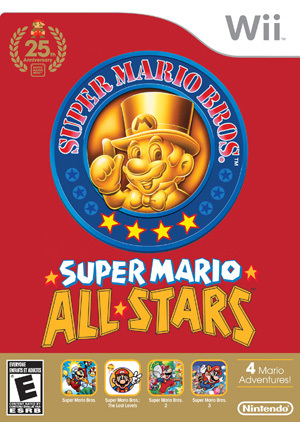 Super Mario All-Stars: 25th Anniversary Edition is a video game compilation having the same contents as Super Mario All-Stars developed by Nintendo for the Wii. It was released in Japan on October 21, 2010, in Australia on December 2, 2010, in Europe on December 3, 2010, and in North America on December 12, 2010. The game is part of the celebration of the 25th anniversary of Super Mario Bros. and includes an emulated ROM of the original Super Mario All-Stars. The game is bundled with a 32-page book of Mario's history, and a 25.24-minute soundtrack audio CD of music through the whole series. Super Mario All-Stars: 25th Anniversary Edition is capable of using both GameCube controllers and Wii Remotes. If a physical controller is set to emulate both a GameCube Controller and a Wii Remote concurrently, it will operate both devices at the same time. To fix, migrate controls to use separate physical controllers. Texture Cache Accuracy must be set to "Safe" to avoid delays in sprite updates with medium/fast. The Widescreen Hack will not work for this game. The game is usually stretched with the Widescreen mode of the Wii. It can all be fixed with a Gecko code. Safe Intermittent delays in sprite updates with medium/fast. The graph below charts the compatibility with Super Mario All-Stars: 25th Anniversary Edition since Dolphin's 2.0 release, listing revisions only where a compatibility change occurred. This page was last edited on 3 March 2018, at 07:52.